Magitech would like to wish you and your family a safe and happy holiday season! In honour of the holidays, Magitech’s first Christmas app, Pocket Snow Globe, brings the wonders of the holidays to your mobile device. In late 2013 we’ll be launching an exciting update to Pocket Snow Globe that adds new music, fireworks and dynamic snow to the app just in time for New Year’s Eve. Ring in the new year with Pocket Snow Globe and watch the globe come alive with fireworks after it counts down to midnight! You can click here to view the app in the Apps Store to purchase the app today and you can look forward to the update in the days leading up to New Year’s Eve. Christmas is at hand with Pocket Snow Globe! Christmas will always be at hand with Pocket Snow Globe which is available now as a universal app for the iPhone and iPad. Design a Christmas village inside your own snow globe and relax as you listen to beautiful renditions of classic Christmas songs. Get set to enjoy the holidays! Click here to view the app in the Apps Store. Bring the joy of the holidays to your device! Celebrate Christmas this season with Magitech’s newest iPhone and iPad app, Pocket Snow Globe! This app gives you the freedom to design your own Christmas village snow globe using the props we’ve provided, which include houses, shops, street lights and trees. The lights on the Christmas trees will flash to the beat of 10 classic Christmas songs as snow gently falls within the globe. The music includes tunes like “Jingle Bells”, “Silent Night” and “The Holly and the Ivy”. This app will be available for sale in the Apps Store soon so check back for updates! Magitech is excited to announce a thrilling update to our popular Vietnam War game, Vertical Assault - Vietnam War. The new update features several new additions to the game such as the Huey is now equipped with missiles and enemy Vietcong soldiers can now fire RPG missiles. New environmental hazards such as trees add a new layer to gameplay as you must avoid treetops or your Huey will take damage. The flying system can now be operated using a joystick for greater ease of movement. We’ve also added 3 exciting new missions to the campaign and the game is now a universal app for both the iPhone and the iPad with improved graphics for iPad users. For current players, be sure to update your game. For new recruits, you can buy the latest version of the app today. Prepare to pilot a Huey! Click here to view the app in the Apps Store. Visit the Halloween Pumpkin House Today! The Halloween Pumpkin House entertainment app for the iPad is now for sale in the Apps Store. Be sure to light your pumpkins! Happy Halloween! Just in time for Halloween, Magitech is preparing to release Halloween Pumpkin House. In this app for the iPad, you can decorate a house with jack-o’-lanterns, lights, tombstones and skeletons. Create a frightful scene and enhance it using weather and sound effects. Enjoy Halloween all year long! Ship inside a Bottle has been released! This is a universal app for both the iPhone and iPad. Click here to view the app in the Apps Store. Explore the open waters with this relaxation app. View calm seas and experience the rough waters of a thunderstorm. Go on a voyage today! Explore the open waters! Magitech will soon be releasing a new universal app called Ship inside a Bottle. Take a journey through the seas as you interact with a boat or floating object as a dynamic weather system impacts on it. Choose from several different ships and tap the sky during heavy rain to create bursts of lightning. Prepare for adventure! Skim Notes can now be purchased for the iPad through the Apps Store. Skim Notes is a handy note app which is ideal for quickly drawing reminders. Simply draw it and stick it! Click here to view the app in the Apps Store. Put a Note in your memory today! Put Notes is now available in the Apps Store. Put Notes is your personal bulletin board. Write out a note using the iPad keyboard and place the note on the bulletin board so you’ll never forget important reminders, memos and dates. Click here to view the app in the Apps Store. Draw it and remember it! We will soon be launching a new note taking application which turns your iPad into a handy notepad/bulletin board while you’re on the go. With Skim Notes you can use your fingertips to draw quick reminders and drawings and then pin the note on a handy bulletin board for future reference. Skim Notes will be available in the Apps Store soon. For our next app release, we will be releasing a productivity application called Put Notes. The app functions as a bulletin board with notes. Fill in the blank notes and place them around the board to serve as reminders and quick lists. It’s simple to use and loads quickly. The app also includes a variety of backdrops including a cork board, desk top and novelty backgrounds like a beer or an underwater scene. Organizing your important notes is a snap with this app! We are pleased to announce that Sango Lite is now available in the Apps Store. Click here to view the product page. Sango Lite gives players the chance to command a clan during the Romance of the Three Kingdoms period. Players can set battle formations which incorporate historical characters along with special abilities that can give gamers an edge in battle. Be strategic in battle and you can overthrow the other clans and unite the kingdoms. Sango Lite is also our first app to be localized in Traditional and Simplified Chinese. Check out the game today! War Gamers Prepare for Sango Lite! Fans of historical RPG strategy games, prepare for your next adventure! We’ll be releasing Sango Lite soon for the iPad. 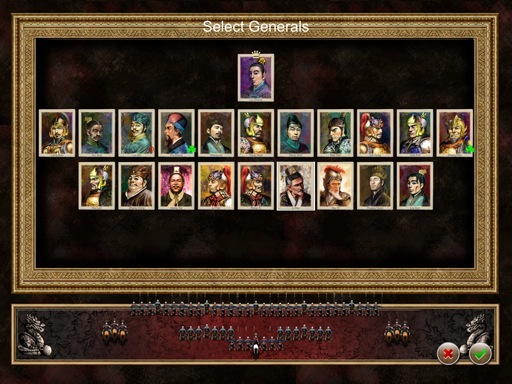 You can command battle formations as you fight clans in the Romance of the Three Kingdoms era. Our new app incorporates real-time strategy battles with RPG elements, making for a thrilling campaign. You’ll be able to start your adventure later this month!